Aussie mic makers Rode aim to bring the sound of classic vintage mics within reach of the home studio. Have they succeeded? My first Rode microphone was the original, creamy-grey Rode NT1. Purchased many years ago, it is still earning its keep in my daughter's home studio, but in the Rode catalogue it was long ago superseded by the popular NT1A, which was both much quieter and somewhat brighter sounding. Now the NT1 name has been resurrected, though the brand-new transformerless mic to which it is attached bears more of a physical resemblance to the NT1A and, like that mic, it too uses innovative surface-mount electronics, combining a JFET impedance converter, IC bias control and bi-polar output circuitry to deliver an extremely low self-noise of 4.5dB EIN. However, Rode are keen to point out that, other than the mesh basket, this is a completely new design throughout, with the capsule voicing drawing its inspiration from classic vintage studio mics. Machined from aluminium, the nickel-plated body is coated in a layer of military-grade ceramic to provide a tough and attractive black finish. It is clear that a lot of engineering development has gone into this microphone. 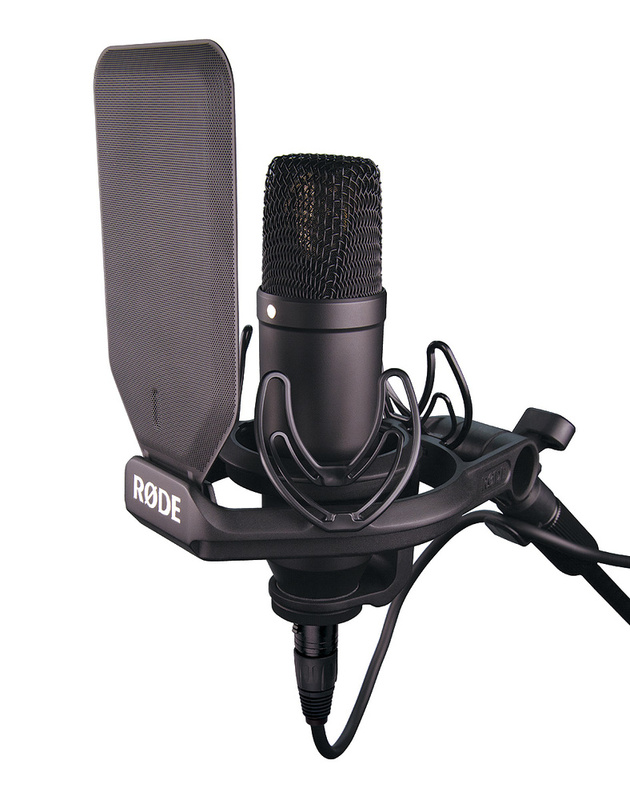 Built in Rode's factory near Sydney, Australia, the mic came for review along with its shockmount, dust bag and pop screen, as part of the NT1 Complete Recording Kit, but is also available as part of a cheaper package that includes just the mic and a mic clip. The NT1 can operate from phantom power in the 24V to 48V range, and it has a one-inch, side-address cardioid-pattern capacitor capsule. While many large-diaphragm capacitor mics have fairly dramatic presence peaks, the NT1 has only the barest hint of a broad hump centred at around 7kHz. The frequency range extends from 20Hz to 20kHz with no significant deviations. It has a quoted sensitivity of -29dB (±2dB) with reference to 1V/Pa, and can handle levels up to 132dB SPL without complaining. There's no pad switch and no LF roll-off switch present, though most mic preamps have these. The lavishly designed SMR shockmount included in this kit is both visually impressive and very effective, due to Rode's licensing of Rycote's patented lyre suspension technology. Rather than use an elastic 'band' suspension, as many shockmounts do, the Rycote lyre is essentially a sophisticated plastic spring that isolates the microphone from the surrounding frame extremely effectively. Rode have tweaked the Rycote formula slightly by using a smaller inner Lyre to act as a tensioner to hold each of the main lyres in their neutral position, to maximise their isolation efficiency. These lyres are clipped firmly into the robust plastic frame, so can't fall off or become misaligned in the way that some elastic suspensions tend to do, and in this design the swivel standmount is built into the frame along with a slot into which clips the equally impressive included pop filter. A locking ring secures the mic to the mount so that it can be used upside down with safety, if required. The internal construction is very different from that used in most other microphones, in that the entire capsule/circuit-board assembly is fitted into a rigid plastic chassis that has a modified lyre suspension moulded into the top of it to support the capsule. This works in a similar way to that employed in the shockmount. Based on two spaced layers of fine metal mesh, the pop screen clips securely in just the right position relative to the mic, making it far more practical than gooseneck-type supports, which in my experience invariably tend to droop. The swivel section also grips firmly when tightened with moderate hand pressure so, again, there's no drooping. Certainly this mount makes the new kit look a lot more sophisticated than the previous NT1A recording package, though in this new incarnation the XLR mic cable has been omitted so you'll need to source your own. A fabric microphone storage pouch completes the kit. It is also worthy of note that if you register your purchase Rode will extend the warranty to 10 years. The mic and shockmount also will be made available separately. Once set up in the studio, the new NT1 sounded surprisingly polished given its modest cost. It brings clarity to the mid-range, helping vocals sit with confidence at the front of the mix, while the top end exudes a hint of air but stops well short of sounding gritty or harsh. Indeed, Rode's description of a vintage character seems most appropriate, as the mic manages to combine a sense of presence with tonal smoothness. This character also carries over to acoustic guitars, giving an artistically pleasing blend of weight, density and detail, but steering clear of stridency. There's also a sense of mild compression that helps even up the sound — an attribute I've noticed with many popular mics, both solid state and valve. This may well be a sonic illusion, but it's a useful one nevertheless. Having such a well-designed shockmount that holds the mic and pop filter firmly in place is a big plus, and as with Rycote's UK-manufactured suspensions, the degree of isolation from stand-borne vibration is impressive and well beyond what you'd expect from typical elastic suspensions. I couldn't detect any compromise in tonality when I was using the pop screen, and the dual-layer construction does a pretty good job of combatting the effects of plosive 'B' and 'P' sounds. As with all vocal mics, you need to try it for yourself to see if it suits your voice, though the lack of any dramatic presence humps and bumps should make it compatible with a wider range of voice types than many 'character' mics, while the NT1's very low noise floor allows for using EQ to shape the tone without worrying about noise penalties. And, of course, having a low noise floor means the mic is better able to deal with more distant or quieter sound sources. Microphone choice is as much about subjectivity as it is spec sheets, but this very affordable microphone ticks a lot of boxes in both areas and definitely deserves a place on anyone's short list. Engineering pros and cons aside, there's a huge number of competing budget mics with a range of tonal characters from manufacturers such as Audio-Technica, SE, MXL, Studio Projects and so on, though you'd need to buy a Rycote or Rode shockmount separately — and the noise floor of the NT1 is a tough act to follow. Superb shockmount and filter included. There's really nothing to complain about at the price, unless you feel you need pad and roll-off switches. A welcome upgrade on the NT1A concept, with a more refined tonality. The shockmount is a great addition and will also fit many other side-address mics, so it is worth buying the kit rather than the mic on its own. NT1 Single £179. Complete Recording Kit £219. Prices include VAT. NT1 Single $249. Complete Recording Kit $269.